This is a very popular question that many students often ask. 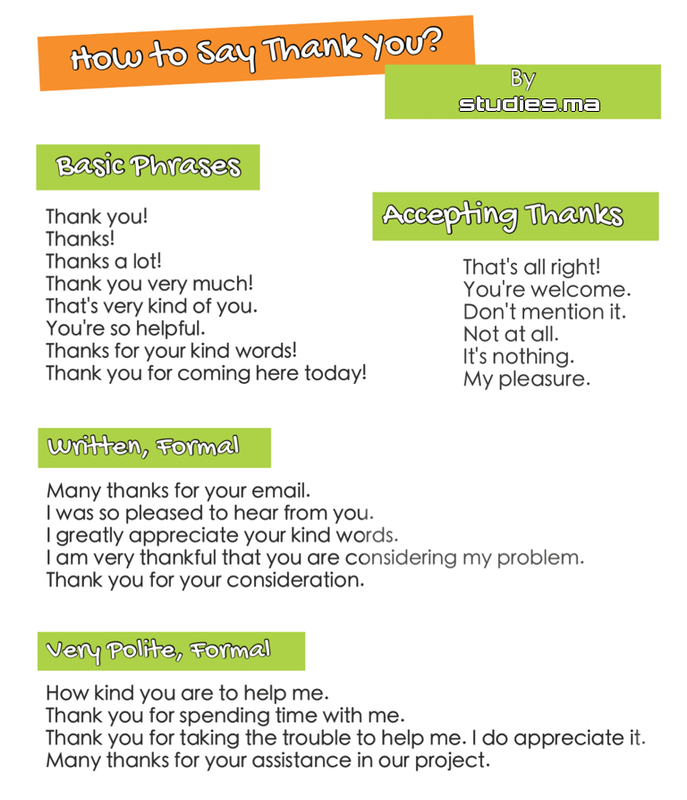 In fact, there are several ways to express your gratitude! -Thank you. That’s very kind of you. -Thank you. You’re so helpful. -Thanks for your kind words. -Thank you for coming here today. -Thank you I really appreciate your help. -I am eternally grateful for everything you’ve taught me. -Thank you for sharing your wisdom with me. -I cannot thank you enough for helping me. -I am very thankful that you are my teacher. -How can I ever thank you enough. -Teachers like you are not easy to find. -I really appreciate all the hard work you’ve done to help me. -I am grateful for the positive learning environment you provided me with. -I have learnt so much, thanks to you. -Thank you for your guidance and support. -Thank you for helping me improve. -I want you to know how much I value your support. -I have had so much fun learning with you! -Your approach to teaching inspires me. -Thank you for being patient and helping me improve. -I wholeheartedly appreciate everything you’ve done for me. -You’re the best teacher ever! -Thank you for joining us today. -We appreciate you sharing our celebrations with us. -Thank you for sharing this special day with us. -We really appreciate your presence here. -Thank you for the gift, we’re very grateful. -I cannot thank you enough for the wonderful gift. -We will remember this day and your contribution forever. -You were invaluable today, thank you for all your help. -Thank you ever so much for your generous gift. -Words cannot describe how grateful we are. -It was a pleasure to be a part of your special day. -Thank you for inviting me to share your special day. -I’m very happy to be a part of your celebrations. -Thank you for extending compassion and flexibility when I needed it. -As a supervisor, you are truly inspirational to your staff. -Your strong leadership skills along with your support has earned you much deserved respect. -Your support and dedication to your team has earned you much deserved admiration. -I am thankful to be a part of your team. -The workers have seen your dedication, and we would like to express our appreciation. -We are grateful for your kindness, loyalty and commitment to all of us. -If there ever was a boss who deserves praise and adulation, that person is you! -Thank you for providing us with such a great working environment. -I want to thank you for the expression of faith in my abilities. -I would like to sincerely thank you for this gesture. -Allow me to express my sincerest gratitude for this opportunity you have given me. -I value the trust you have put into me and will work hard to maintain it. -Thank you very much for putting your trust in me and agreeing to my extended holiday request. -I am eternally grateful for your trust, and appreciate you allowing me to have this time off work. -Thank you for your support, guidance and encouragement. -Thank you for the opportunities you provided, and for having faith in me. -I would like to express my heartfelt thanks for giving me this opportunity. -Thank you very much; your support is greatly appreciated. -We would like to express our gratitude. -I am most grateful for your support. -Thank you for providing the requested information. -Thank you for all your assistance. -Thank you for raising your concerns. -Thank you for your kind co-operation. -Thank you for your attention to this matter. -Thank you for your consideration. -Thank you once again for everything you’ve done. -How kind you are to help me. Thank you very much. -Thank you for spending time with me. -Thank you for taking the trouble to help me. I do appreciate it. -Many thanks for your assistance in our project. -Many thanks for your letter/email. -I was so pleased to hear from you. -I greatly appreciate your kind words. -I am very thankful that you are considering my problem. -Thank you for your kind consideration. -It wasn’t a problem at all. -The pleasure is all mine.